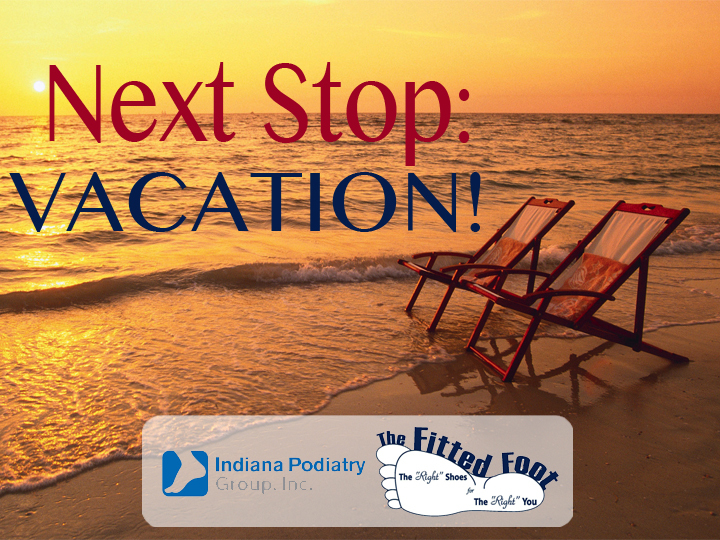 When considering care of feet and legs for vacation some things come to mind. First, if traveling long distances you may want to consider donning a pair of compression socks. Why? Because when you sit for long periods, the blood pools in the lower leg veins and makes one susceptible to a blood clot. Compression stockings gently squeeze your legs to move blood up your legs. This helps prevent leg swelling and, to a lesser extent, blood clots. Additionally, take breaks to move those legs. Stretch, and pump your feet. Make sure to wear an excellent shoe for walking. Sandals with thick sole, good arch support, and non-flexible, as well as good strapping across the top will prevent most overuse injuries to the foot including planter fasciitis, extensor tendonitis and stress fractures. We don’t recommend wearing the new pair though so make sure you give yourself time to break them in. Wear sunblock. The feet don’t see much sun and naïve skin is susceptible to burns and burned skin is susceptible to future skin cancers. Not to mention, bad burns can lead to swelling and subsequent dehydration. Pack an antifungal cream or powder. If you're staying in a hotel or using public pools, using an antifungal product can help prevent athlete's foot.